Wednesday, the Harris Campaign released results of an internal push poll. The "poll" shows that when "character" questions are raised about Thom Tillis, he falls from 1st place to 3rd behind Harris and Greg Brannon. Regardless of the source, or the probable flaws in the sampling technique of a campaign's internal poll, or the hypocrisy of using unethical push polling to question another candidate's character, these results do show that raising these questions does very negatively impact the results for the Speaker. Thursday saw the rise of a story about Thom Tillis's college education history. The story was broken by TalkingPointsMemo website. It pointed out multiple occasions both on websites and in interviews where the Speaker's college credentials were incorrectly stated as being from University of Maryland at College Park (the flagship of the Maryland system) rather than University of Maryland University College (a primarily online college). The Tillis campaign brushed this off as a simple mistake (and it very well may be), but it plays right into the vein of questioning that the Harris poll was attacking. Finally, on Friday Thom Tillis's old opponent for the NC98 legislative seat - John Rhodes - unloaded a barrage of ethical questions about the Speaker from Cornelius Town Hall. Tillis supporters dismiss this as nothing but sour grapes by an old political foe, but again it plays right into Harris's argument. Obviously a rough week no campaign wants to repeat. Against this backdrop, Mecklenburg Republicans head to their County Convention this coming Saturday. At last year's convention, delegates unanimously passed a resolution against HOT Lanes - one of the Speaker's signature "achievements". See MeckGOP Raises the Political Stakes for HOT Lanes Supporters for the details on the events a year ago. Somewhat ironically, HOT Lanes are once again in the local news as the final proposals for the project are scheduled to be submitted at the end of this month. How this issue plays out at this year's MeckGOP convention will be fun to watch as candidates use their opposition to the plan as something to distinguish themselves or have to defend against their support for it. Greg Brannon and Mark Harris have each racked up wins in straw polls at these conventions across the state. Speaker Tillis won big recently in a straw poll in Lincoln County but did less well in a closer victory at the Iredell County GOP Convention. Straw polls often don't mean much. They are made up only of strong partisans and activists. They aren't representative of the whole political party - much less the general electorate. Their main value is in the crowing that can be done by the victor. However, the importance of Mecklenburg's might be different. Mecklenburg County has the second largest number of Republicans in the state. (Wake has the most.) Mecklenburg is also home to two of the top candidates - Mark Harris and Thom Tillis. How Mecklenburg goes could very well determine the outcome of this primary. Reading the tea leaves on any data point - even one like a straw poll - could provide some important insights. For Thom Tillis there's no real upside to a MeckGOP straw poll - only downside risk. If Tillis wins big, the other candidates can brush it off as 'expected' in the Speaker's home county. However, if Tillis does not win big, that will be trumpeted by his opponents as a real sign of vulnerability. With Mark Harris also calling Mecklenburg home, he should do well. Greg Brannon has a strong following among the local Tea Party crowd - a group that goes to conventions and votes. There was a real effort last year by those running the convention to minimize the impact of the unanimous vote against the HOT Lanes the Speaker supports. It wouldn't be surprising to see similar efforts around a straw poll this Saturday. The best outcome for the Speaker is to not even have one. Bonus Observation: After doubling down on the "character" line of attack this week, it seems safe to say the Harris Campaign is in it to win it. This should dispel the notion that he's nothing but a stalking horse for Thom Tillis. See Tillis accuses Harris of 'going negative' and Harris fires back. Update: Word has been received that there likely will not be a straw poll at tomorrow's convention. Apparently, Mecklenburg typically does not have them regularly at this event. Smaller counties regularly have them, but apparently larger ones sometimes do not. However, GOP straw polls in large counties do have recent precedent during Federal election years. Wake County, the largest GOP county in the state, had one at their 2012 convention. The MeckGOP also had one at its 2012 countywide precinct meeting. In fact, google searches show all of the top five GOP counties having some form of straw poll at some form of party event during 2012. 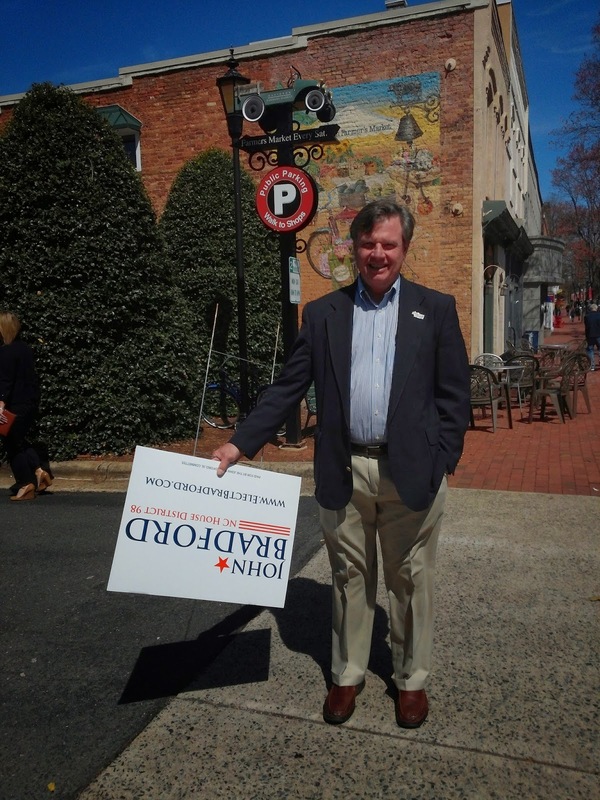 Campaign signs began popping up this weekend, and John Bradford's campaign for NC House 98 found some interesting locations in Davidson. Interesting for their boldness as well as the less than likely odds of them lasting very long. Were they chosen to make a point? 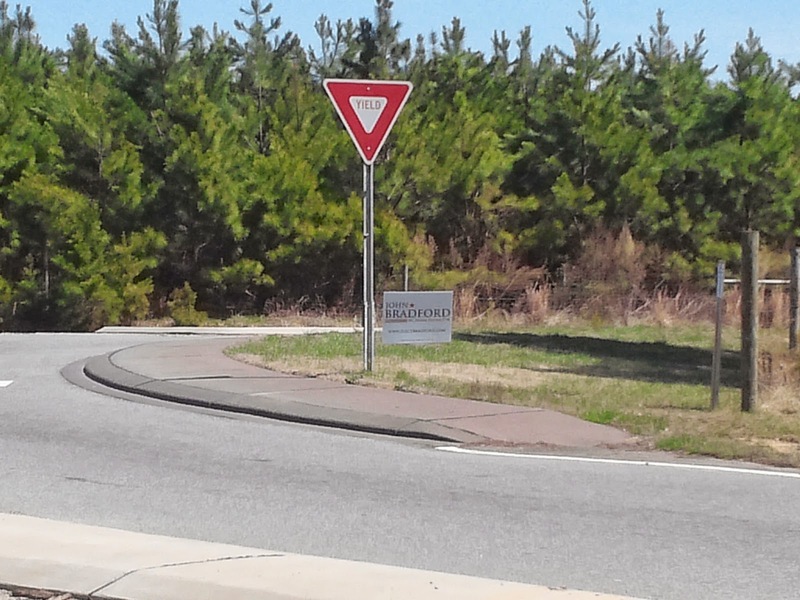 Or were they just placed by someone without much experience placing campaign signs in Davidson? In front of River Run...this one might survive..a while. After what can best be described as an act of high-dollar "NIMBYism", The Pines has shown the real need for a PILOT program here in Davidson. "In order to assure that the Fishback Property is maintained and would someday be used in a way that meets the best interests of The Pines and its current and future residents, The Pines purchased the Fishback Property from the developer for a purchase price of $2,837,500." 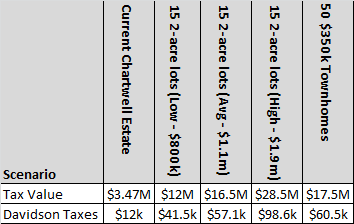 What exact form development of the Chartwell property would have taken is just speculation, but most certainly any development would have brought significantly increased tax revenues to the town and would have met the town goals to increase density in areas walkable to the town center. The Chartwell estate currently generates about $12,000/year in taxes for the town. The Pines purchase will take it off the books as The Pines is a non-profit organization. However, the $12k/year is just a drop in the bucket when compared to the various possibilities if the property was developed. The below chart outlines various development scenarios for the 31 acres off of Avinger lane. It includes current development, various development scenarios as 2 acre lots, and development as higher end town homes with roughly 50% open space. The three single-family lot scenarios are presented based on the values of several nearby properties that are roughly 2 acres a piece. What the above chart shows is that The Pines just cost the Town of Davidson much more than the current $12,000 per year in taxes. The true opportunity cost to the town is more likely somewhere in the range of $50-$100k per year. That's real money for a town that has huge subsidies for Mi-Connection on its books, the highest tax rates in the area when compared to neighboring towns, and a need for a new fire station looming in our near future. Add this to the recent cost of adding CHS as another tax exempt major land owner as well as the perpetual cost to the town from the College, and you have the makings of a real problem for our town. 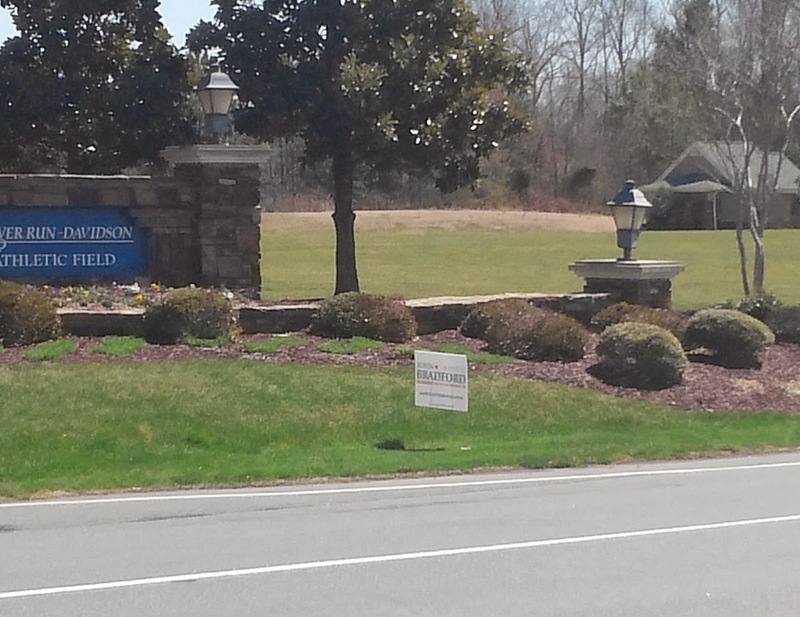 Currently, Davidson receives Payments in Lieu of Taxes (PILOT) payments from the College and the Pines. However, the town receives nothing from CHS. Also, the amounts paid are wildly inconsistent based on the services received. A solution to this problem is available. A model does exist that encourages non-profits to pay their fair share for the benefits they receive. The City of Boston implemented a formal PILOT program and in FY2013 received a 53% increase in payments over what had been received in FY2011. It has been a huge success in getting major non-profits to pay their fair share toward the expenses they incur for the City. Here are some highlights of the program. It is aimed only at major non-profits, not smaller organizations. In Davidson that would mean only CHS, The Pines, and Davidson College - not, Ada Jenkins, churches, or any of the smaller operations like the Davidson Cornelius Child Development Center. It accounts for both cash and intangible benefits these large non-profits provide the municipality. It provides a transparent formula for non-profits and local government to operate under when it comes to PILOT payments. It removes one-off side deals from the picture which is good for both sides of this situation. The government is not in the position of negotiating with multiple entities, and the non-profits can not be accused of receiving favorable treatment which is bad for their image. Rather than spending the next year looking at if there's a need for a program, or how other town's handle this situation, Davidson's Town Board should immediately direct the Town of Davidson Staff to contact the City of Boston for some real-world feedback on this type of program and begin implementing something similar here based on their proven model. The wrong option here is to continue letting major non-profits take advantage of the town by buying up property and continuing to not cover the costs of basic services like police and fire protection. Davdison's Town Board met Tuesday night for it's monthly meeting. Here's what it looked like in 144 character sound bites. 6:20pm @TownofDavidson presentation on E2D (Eliminate the Digital Divide) to get computers to all #Davidson homes w/o one...200 delivered to date. 6:29pm @TownofDavidson...#Davidson E2D program leader Pat Millen makes impassioned pitch for fixing a single home at a time...it only takes $200! --This presentation is a great reason why Davidson should video all meetings. It was excellent and more people should be able to see it. Commissioner Fuller held it up as an example of "the Davidson Way". 6:33pm @TownofDavidson consultant Kathleen Rose gives update on PiES #Davidson green business incubator. Town in P3 relatiknship w/ PiES. 6:37pm @TownofDavidson consultant Kathleen Rose gives update on PiES #Davidson green business incubator. Town in P3 relatiknship w/ PiES. 6:41pm @TownofDavidson town manager Leamon Brice on board of PiES- #Davidson in 3yr relationship...town brd to vote later on extending that. 6:52pm @TownofDavidson #Davidson #Cornelius Child Dev Ctr also asking for CDBG $98k for scholarships for low income families. 6:58 @TownofDavidson unanimously renews PiES #Davidson agreement with sexual orientation anti-discrimination clause added. 7:05pm @TownofDavidson #Davidson Board micro-manages real estate market 2 make it feasible 4 certain AH program mbrs 2 sell #unintendedconsequences --A sign of a broken program is when the Town Board has spend time determining if someone else can sell their own property for 2% or 3% more than the town ordinance allows and they have to do it for only 1 year. 7:24pm @TownofDavidson hearing presentation on #Davidson planning ordinance changes to discourage "rural area" development and keep open space. 7:31pm @TownofDavidson discusses "open space" definition for #Davidson. If it is not open to public, is it open? --Unbuilt space at large lot home sites has sometimes been counted as "open space". Board seems to be leaning against planning ordinance continuation of allowing that practice. 7:35pm @TownofDavidson summarizes action items from #Davidson Board meeting...new item for these meetings...should improve effectiveness. At the February 19th town board meeting, Commissioners voted unanimously to acknowledge that affordable housing restrictions no longer applied to a single unit in the South Main Square Condos. This was due to a foreclosure that happened on the property in 2011. The Board did not vote to remove the restrictions. They simply voted to acknowledge that the restrictions were already removed as a result of the 2011 foreclosure. However, if it was not for some last minute legal eagling by Davidson's Town Attorney, Rick Kline, our Board would have been facing a vote on something that would have looked, really, really bad. An error in the story by the Lake Norman Citizen encouraged a deeper look at the details of what the Board did that night. It also brings to light another real flaw in Davidson's affordable housing program. See previous story here on a different but similar issue where the affordable housing program did not work as planned. The Board action was initiated by a request from Kathleen Rose of Davidson. Ms. Rose is a principle of Urban Organics LLC, the owner of the South Main Square Condos purchased out of foreclosure from People's Bank (Mayor Woods's employer) in 2011. People's Bank was apparently the construction loan lender. She also has served as a consultant to the town - putting together the town's economic development strategy. Moreover, town staff also believed the restrictions were in place up until just before this meeting. It was not until Town Attorney Rick Kline got involved was it determined that the deed restrictions did in fact fall away when the property went through foreclosure in 2011. The town's affordable housing coordinator, Cindy Reid, confirmed this in an email. 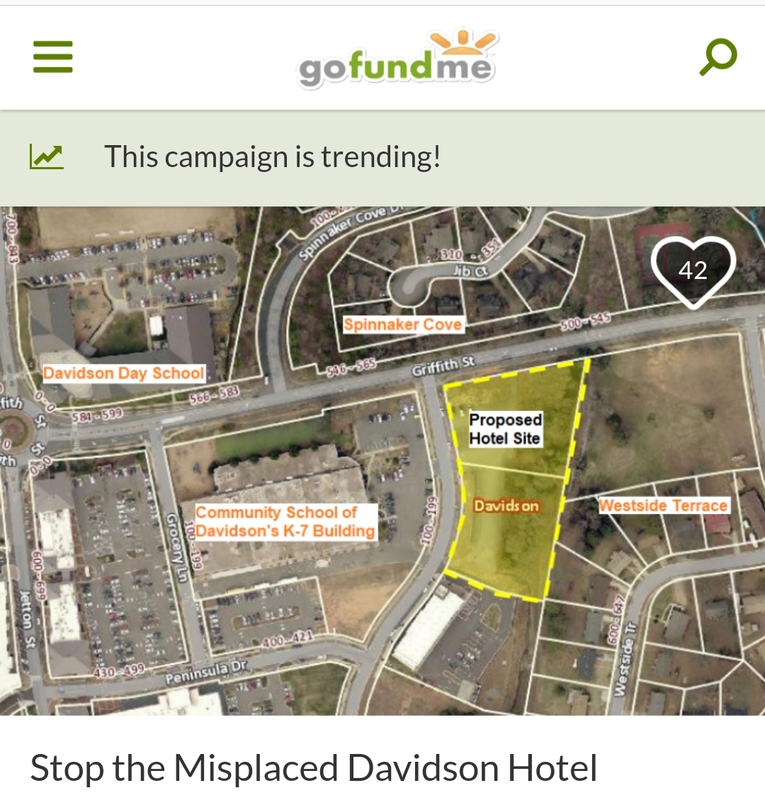 Ultimately, it's a good thing Mr. Kline was able to figure this one out because otherwise the Davidson Town Board would have been facing a real sticky wicket of a decision. Because this was resolved, the Board effectively didn't have to eliminate anything. They simply acknowledged what had apparently already happened years ago. However, if the Board had actually voted to release the restrictions they would have in effect been showing a bit of favoritism to someone who can best be described as an insider in town affairs; someone who bought a property from Mayor Woods's employer; someone who thought the property was in the affordable housing program, had treated it that way for years, and was now trying to get out of it to make a little money. We should all be glad the Board didn't vote to actually to that. That would have looked really, really bad. It's still unclear why it was thought that asking for special treatment might actually work, or why Ms. Rose was even asking the question. It's clear she thought asking it might look bad by saying in her note that this somehow would not be "setting a precedent" as if this situation was totally unique. But of course, it would set a precedent. Remember, it's clear that everyone thought the deed restrictions were in place after the foreclosure up until a couple of weeks ago. People may have thought they should have gone away, but they were operating as if they were still there. The precedent here is that the onerous affordable housing restrictions are keeping people from being able to sell their homes. If you can get the restrictions lifted, then you can. That's why the question was being asked. The mere fact that the foreclosure caused the deed restrictions to fall away according to Mr. Kline was just good fortune. There's an old saying, "sometimes it's better to be lucky than good." In this case both Ms. Rose and the Town Board were on the receiving end of that sentiment. "The South Main Square development was foreclosed by People's Bank on 2/25/2011. It was purchased on 5/12/2011 by Urban Organics. One of the three affordable condominiums was included in the foreclosure. Usually, a foreclosure will act to eliminate restrictions that were recorded after the original deed of trust; however, in this case the deed restrictions survived the foreclosure. 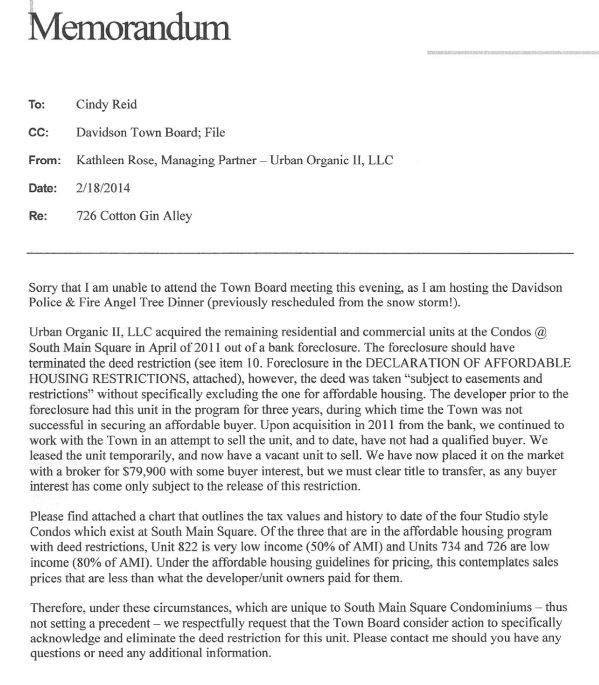 Kathleen Rose, principal of Urban Organics, LLC, has requested the town to officially release the restrictions on the affordable unit to clear title to the property. Staff recommends release for the following reasons:1.The three affordable condominiums (822, 726 and 734 Cotton Gin Alley) were built in 2008. Staff and the Davidson Housing Coalition tried to find buyers for these units but there was not a market for a 550 square foot efficiency unit. One of the units sold in January 2009 to a qualified purchaser and the other was sold in October 2009 to an unqualified buyer. Attempts to sell the third unit were unsuccessful even at a reduced price. Kathleen has periodically rented the unit. 2.The Davidson Housing Coalition maintains a waiting list for affordable properties. No one has been interested in purchasing this particular unit in the past four years. Recently, the owner of 822 Cotton Gin indicated that she wants to sell. Nobody on the waiting list is interested, even at the $65,000 price. 3. The size and location of these units is off-putting to affordable buyers. Most of our buyers want two or three bedrooms because they have children. Since these units were built, the ordinance has been amended to require larger minimum sizes." Staff was recommending release not for any reason due to the foreclosure but simply because there is no market within the affordable housing program for this type of unit. Also, from Ms. Rose's note she states that "any buyer interest has come only subject to the release of this restriction." So, what happens to the owners of condos 822 and 734 - the other affordable units in the complex just like Ms. Rose's unit that did not go through the foreclosure? They still have the restrictions in place, but Town Staff is admitting that there is no market for them. Staff even points out that one of them wants to sell, but can't. Just because Ms. Rose got lucky on this one should not leave those other owners out to dry. If the Town wants to do the right thing here, they should figure out a way to release these other two units as well. The current owners shouldn't get a windfall by being able to sell at a market rate because they did knowingly enter into an affordable housing contract. However, they also shouldn't necessarily be "trapped" in the property solely because of a Town policy. With a little effort on the legal side, the Town should be able to figure out how to structure a deal where these could be sold at market price without deed restrictions and any windfall that occurs goes to the Davidson Housing Coalition (or something like that). An affordable housing program should be designed to give people a leg up, not trap them in serfdom.